Coco after his embedded collar was removed. And truthfully, that’s all Coco needs. He needs you. But let me back up a bit and tell you Coco’s story. Coco was confiscated as a cruelty case back in January and brought to Tulsa Animal Welfare. There, the vet removed the collar embedded so deeply it left the horrific wounds you see in the photos above. 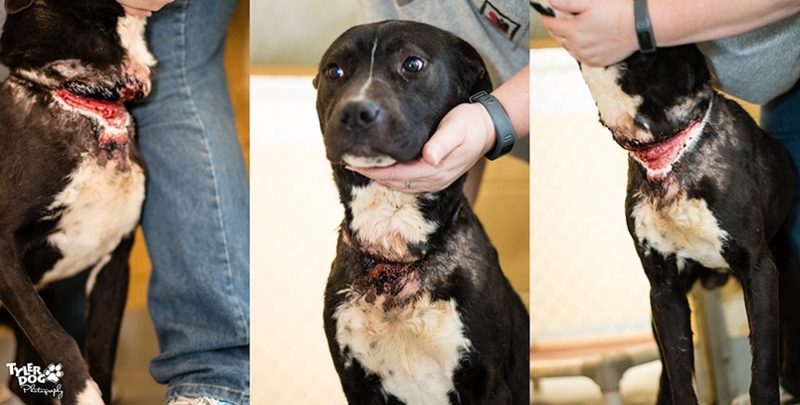 According to Adoption Coordinator Tiane Christy, “It was one of the worst embedded collars we’ve ever seen.” Coming from someone who’s spent years in animal welfare, that’s saying a lot. A few days later, we were asked to take his photo. We went into his kennel, ever concerned to make this as painless as possible given his condition. Gently, my handler lifted his head. Instead of growling or snarling or snapping, Coco stood quietly, wagging his tail as we worked. We whispered to him sweet nothings, gently petted his head, and gave him hugs and treats, then went on to the next one. I left that night wondering how someone does that to an animal? Leave a collar on so long it embeds itself into their flesh, tearing and cutting in so tightly it must be surgically removed? How does that happen?! As with most questions like this, I had no answers. Fast forward a bit later and guess what? Coco hit the jackpot! He was adopted! Went home with a great person and we all promptly moved on to the next dog to network. The next crisis to avert. The next dog to save. Coco after healing from his embedded collar. Arriving for our regular TylerDog Photography rescue shoot, imagine my surprise when I see who’s on the list for a photo? Coco! I went to Tiane and asked what happened. She said the landlord told the owner he couldn’t have a Pit Bull, so Coco was returned. Now, mind you, Coco is a mix. Sure his head is a little blocky, but his coat is thick like an Akita. His snout is longer than a Pibble and his body bigger. While he might be part Pit Bull, Coco is, in fact, a mixed breed dog. Because of a biased and uneducated landlord, though, Coco was returned to yet again sit in a kennel. Doesn’t matter he survived horrific cruelty. Doesn’t matter he passed his dog temperament test. Doesn’t matter he’s good with people, loves kids, loves to play. Doesn’t matter he’s a great dog with awesome manners. 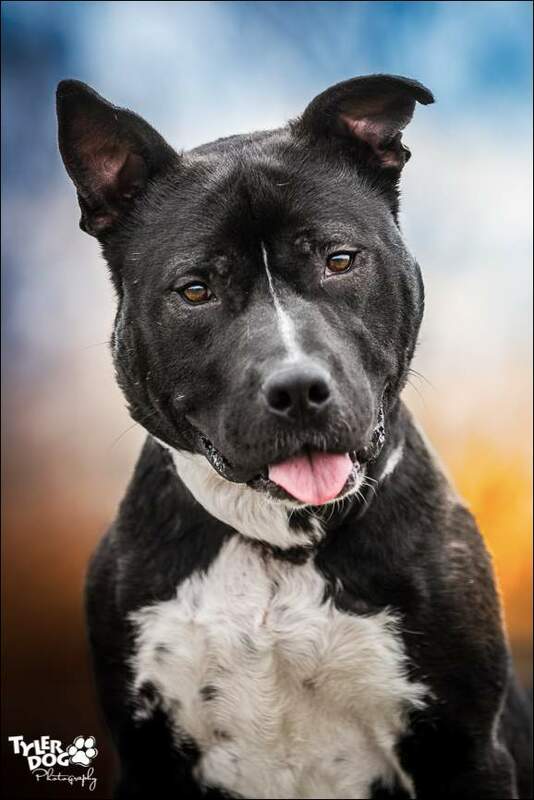 He was returned for one reason alone – he was perceived to be a Pit Bull. So day after day, week after week, Coco sat as people walked by. As the shelter began to fill up, the staff grew concerned and moved him to a prime spot where he would be the first dog people saw when they walked into the kennel area. Ears up. Tail wagging. Smiling and tongue hanging out. Rubbing against the kennel door just to get someone to pet him. And yet, they still walked by. So here I am, trying to help. Coco’s critical. He’s out of time. Coco needs a miracle. The upside to a municipal shelter is they must take in all animals in their jurisdiction. The downside to a municipal shelter is once the shelter is full, unpleasant decisions have to be made. Coco has already been on the list twice to be euthanized for space. Before you cry foul and say “the shelter should be no kill” I want you to look at this logically. There is no more room! More dogs come in than go out! If a dog sits for weeks on end, with no interest for adoption, it becomes apparent which ones have to be euthanized. Don’t like it? Put boots on the ground and start helping us change it. But until then, Coco needs a miracle. Please, if you can find it in your heart, help this boy. If you can’t adopt, consider fostering (a rescue group would have to pull him). If you can’t foster, network him. Coco’s been through too much to have it end like this. Please, all he needs is a miracle, all he needs is you. UPDATE! Coco was initially pulled by Oklahoma Alliance for Animals after we posted his story and subsequently adopted by a wonderful lady shortly thereafter!